Organizers for the first color race in the Quad Cities have made the decision to cap participants because of overwhelming feedback. Early registration activity for Color the Quads 5K Run has resulted in the need to cap the participant field. In just one month since the race was announced, over 1,500 participants have signed up for this unique charity run to be held June 1. Runners and walkers are encouraged to register today to ensure participation in the event. 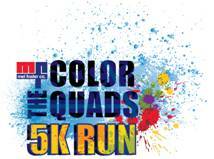 The Color the Quads 5K will take place Saturday, June 1 at 4:00 p.m., Cumberland Square at 2300 Spruce Hills Drive, Bettendorf, Iowa. The 5K registration fee is $35 until April 1 and $40 until May 27. The fee includes race entry, t-shirt and swag bag. The majority of early registrants are from Iowa, Illinois and surrounding states, but runners from as far away as Tennessee and Arizona have registered. The Kids Color Dash cost is $15 until April 1 and $20 until May 27. Kids Color Dash starts at 9:00 a.m. on June 1. During the 5K and Kids Color Dash, runners and walkers will get blasted with bursts of safe color powder on the course. All race participants are invited to attend the colorful Tri-City Electric Co. After-Party. The 2013 Color the Quads event benefits two local organizations, the YMCA Youth Solutions and Camp Abe Lincoln and the Children's Therapy Center of the Quad Cities. The event brings colorful happiness to our community AND helps out local charities. The event’s After Party sponsor is Tri-City Electric, Color Explosion and Color Burst sponsors include; Mel Foster Co., Orthopaedic Specialists, Pear Advertising, Terrostar, Valley Bank, Vollertsen, Britt & Gorsline P.C., Radon Solutions, Hawkeye Paving, Quad City Times, TMI – Total Maintenance Inc. and Build to Suit. For more information, to sign up, to volunteer, or to become a sponsor, visit http://www.colorthequads.com. Mel Foster Co. is a recognized leader for real estate and insurance. Mel Foster Co. Real Estate specializes in residential sales and offers services for a broader spectrum of property transactions including commercial, farm and land, land development and management, relocation and new construction. Founded in 1921, it is one of Iowa’s largest independently owned real estate companies. Mel Foster Insurance was founded in 1932 and represents over 25 insurance carriers and offers coverage for residential and commercial clients. Visit http://www.melfosterco.com for more information.